What the Japanese appeared to be offering was not unconditional surrender. As so many advisers in President Truman’s inner circle had predicted, it was indeed the fate of Japan’s emperor that was the ultimate question that separated war from peace. At 9:00AM Washington time, Truman sat down with the heads of the most important positions in his administration: Admiral Leahy (Chief of Staff), Jimmy Byrnes (Secretary of State), Henry Stimson (Secretary of War), and James Forrestal (Secretary of Defense). He went around the room and asked each man for his opinion on what to do next. Leahy and Stimson didn’t have a problem with Japan’s wanting to keep their emperor. If anything, they believed that he would be useful when it came to inspiring peace among the Japanese people after WWII. Jimmy Byrnes, however, adamantly refused. He wanted nothing less than unconditional surrender. It was the policy that Roosevelt and Churchill had agreed to at the Casablanca Conference in January of 1943 and at the Cairo Conference in November 1943. 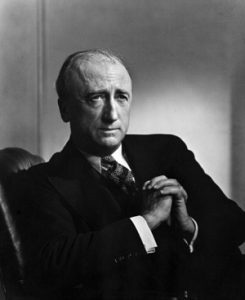 Furthermore, he quickly reminded the President that unconditional surrender was once again reconfirmed at the Potsdam Conference just two weeks before. Truman then asked to see the Potsdam Declaration one more time. That was to say, the emperor could remain if he surrendered unconditionally. 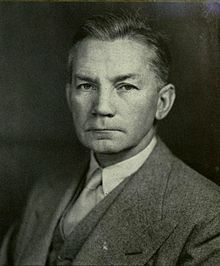 United States Secretary of Defense James Forrestal whose revision of the words of unconditional surrender would help bring WWII to an end on paper. Jimmy Byrnes then got to work on the reply. 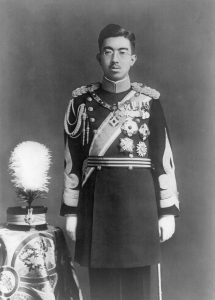 It would eventually state that the Emperor would remain but “subject to the Supreme Commander of the Allied Powers.” In other words, the reply attempted to satisfy all those Americans who demanded unconditional surrender, while allowing the Japanese the right to retain their emperor; and thus, for peace to be achieved. And the new “Supreme Commander of the Allied Powers” – to whom the Japanese emperor would now have to answer – would be the extremely popular general, Douglas MacArthur. If it wasn’t unconditional surrender, it was something very close to it. Now the President needed the official approval of the two other countries that jointly issued the Potsdam Declaration, China and Great Britain, as well as the Soviets who were now at war with Japan. Prime Minister Attlee cabled his approval that evening (Churchill also called the American embassy in London to express his approval), but the Australians were adamantly opposed. “The Emperor should have no immunity from responsibility for Japan’s acts of aggression…Unless the system goes, the Japanese will remain unchanged and recrudescence of aggression in the Pacific will only be postponed to a later generation,” said the Australians, who had been excluded from Potsdam and who had fought long and suffered greatly in the war with Japan. 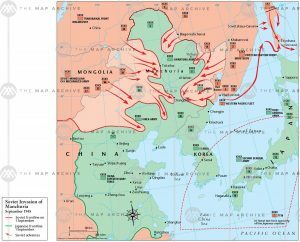 The Soviet Union’s assault on Manchuria in the initial days of its invasion in August 1945. The Chinese cabled their agreement the next morning (Saturday, August 11), as did the Australians, but reluctantly. The Soviets, however, were stalling. They appeared to be doing this deliberately in the hopes of having some say in the control of Japan and to drive farther into Manchuria (where Soviet troops had already arrived days before), but Washington made it crystal clear that they would not agree to any Soviet claim in Japan. Eventually, Stalin also agreed. A formal reply, with the approval of the four nations at war with Japan, was now transmitted to Tokyo. The wait for Japan to accept these somewhat revised terms of unconditional surrender would now begin.